A compass rose is embedded in the cobblestones below my feet. It’s fitting decoration for a place where the course of history has changed direction so many times since work began on Notre Dame in 1163 — work that took nearly 200 years later to complete. The third crusade was launched from here. Henry VI of England was crowned king of France. 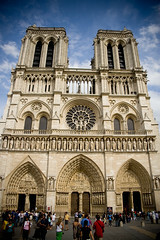 The cathedral bells signaled the Allied liberation of Paris during WWII. Philippe Petit walked a tight rope between the two towers. And presumably scared his mother to death. Speaking of change….Image this. Construction of this western façade alone took 80 years. That’s why the face of the building is layered like tiers on a wedding cake. None of the architects in charge of the building project lived long enough to see it to completion from start to finish. When the architect changed, so did the creative vision for the structure. Progress was too slow in to keep up with the latest 12th century masonry fashion.When a new archetect came on board, new creative direction was given. Changing her mind is Our Lady’s prerogative, I suppose. And though this massive cathedral was centuries in the baking, it’s eclectic tiers of stonework make it a multi-layered slice of public history. This entry was posted in church, culture, history, photography, travel. Tagged church, history, notre dame, paris, photos, travel.